TheBrain lets you see and connect everything across all your devices. Capture ideas, web pages, files and notes and always find them - just like you think of them. With TheBrain you will even see related items that would otherwise be forgotten. 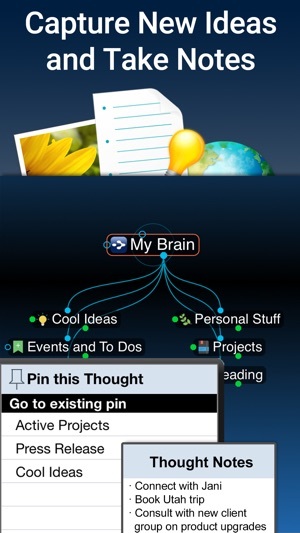 TheBrain combines the best of note taking, file synchronization and mind mapping apps to give you the ultimate digital memory. See your ideas and information like never before with your own digital Brain. Navigate across all key topics and information within your Brain's Thought network and connections. 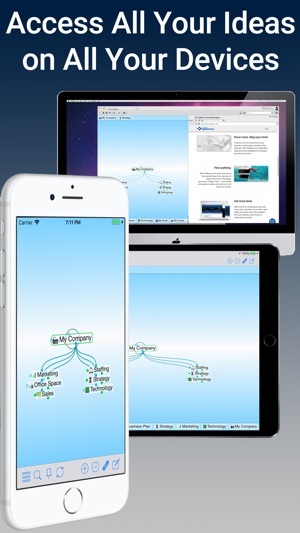 Move beyond conventional mind maps and linear folder storage with TheBrain’s animated links and visualization that enable any Thought or file to be connected to anything else. Just type in a new Thought, make a connection or take a note. Your Brain stores it all. Your Brain can be accessed anywhere. This means all your key ideas, notes and files are available to you on all your devices! Find any file, web page or idea in seconds. Add web pages, photos and documents to your Thoughts. All linked the way you think. 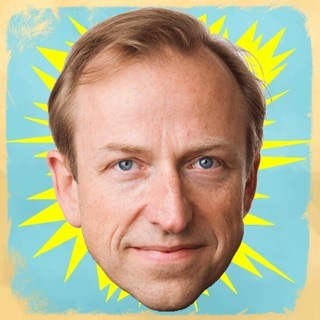 Publish and share your Brain on the cloud. You can even synchronize Thoughts with team members through TheBrain Desktop software. • Digitize your mind. Start with your name then create Thoughts for all aspects of your business and personal life. Your Brain will be become a reflection of your mind and grow more powerful as you use it. • Use as "everything in your life manager" or for key projects. You’ll get the big picture on all your information and drill down to the right file or detail within seconds. • Capture your ideas and interesting content and activate it in your Brain when you need it. 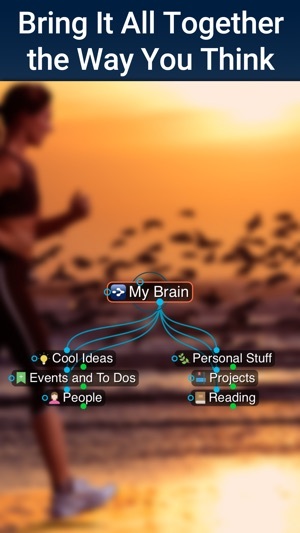 • Use your Brain to organize trips, travel and key events. • Add Thoughts to deepen understanding on key concepts for smarter research. • Go from ideas to action by capturing all your goals and then adding even more connected Thoughts and all the right information to achieve and get things done. • Brainstorm and build a complete knowledgebase to foster innovative ideas and inject some spark in your projects. • Aggregate all your inspirations in a way that captures your vision and take any writing project to the next level. • Link people, projects and the right information to get a smarter view of business operations. • Create a topic-oriented Brain on your key passion or special interest to bring all the right content to life and get the big picture. • Create Brains and add Thoughts for your personal projects like home renovations or new product purchases for personal productivity and organization. • To make the most of TheBrain install it on your computer and all devices. TheBrain's powerful macOS and Windows clients sync seamlessly with iOS so you’ll always have your best ideas and information with you. I’ve been with TheBrain for a long time and have been a satisfied customer throughout. 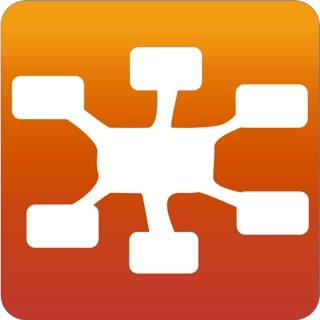 If you are looking for a powerful, nonlinear file and note management system, this is the app,I action I would recommend. The team is constantly upgrading and improving the software and available to provide assistance as required by subscribers. I can’t say enough about how much great this application has been for my purposes. Highly recommend. I’ve been a huge user of TB for some time. I really like seeing images in the iOS notes section. However, there is one bug I was hoping would be fixed in the iOS version. Unfortunately it’s still there. Don’t paste an image into the iOS Notes section. While it displays on the iPad, the image isn’t copied into the cloud server. That means if you are using any other platform, the image won’t appear. All that you see is a square box outline. Then after a few syncs, the image in iOS will disappear leaving just the square box. Bottom line: your work is lost. The workaround until the problem is fixed is to store the image as an attachment. 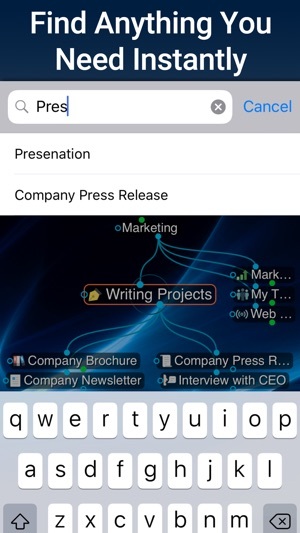 From a platform other than iOS, you can copy and paste the attachment into the Notes section. It will then appear everywhere including iPad and iPhone. Update: v9.1.5 fixes the copy & paste problem. It's pure trickery. You get 30 days acess. Then you need to pay $299 for the first year and then $159 thereafter. A second option is to pay $180 every year starting from the beginning. No software is worth that price. There is excellent mind mapping software in here that does just as good a job for less than $20. These folks aren't honest enough to tell you the true costs up front. Why would you want to team up with just non-disclosure.